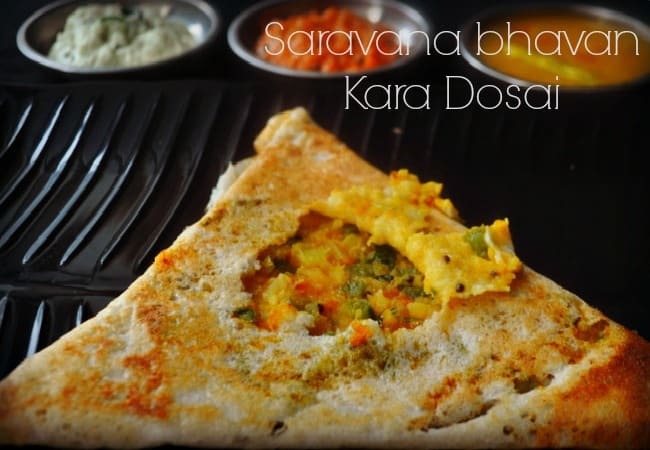 Saravana bhavan kara dosai recipe, with step by step pics and video. Kara dosai is similar to our usual masala(masal)dosai but only difference is that this is more spicy than the normal masal dosai. 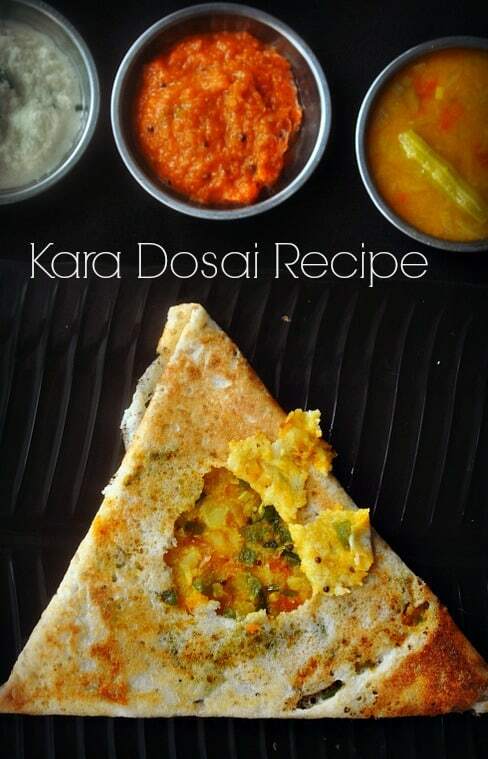 The spicy masala made with potatoes and other vegetables are stuffed inside the dosai is called kara dosai. spicy in tamil name karam named the dosai as kara dosai. Heat a kadai and temper with mustard seeds and spilt urad dal. Add finely chopped onions and tomatoes,fry till transparent. Add capsicum, fry for a minute in medium flame. Add red chilli powder,turmeric and salt. Fry till everything turns mushy and to a masala. Add the mashed potato and blend well for a minute in medium flame. Add 1/3 cup water, cook covered for 5 minutes in low flame (or until veg are cooked). Sprinkle water if its too dry and mix well. Add coriander leaves finally.To make dosa (I used my idli dosa batter itself), pour a laddle full of batter and spread evenly. Let it get cooked half way, then place the masala, 2tblsp, in the mid. Fold Slightly the down part first. Again fold the two sides to make a triangular shaped dosa. You can fold into two simply as well.Kara dosai is ready to serve now. 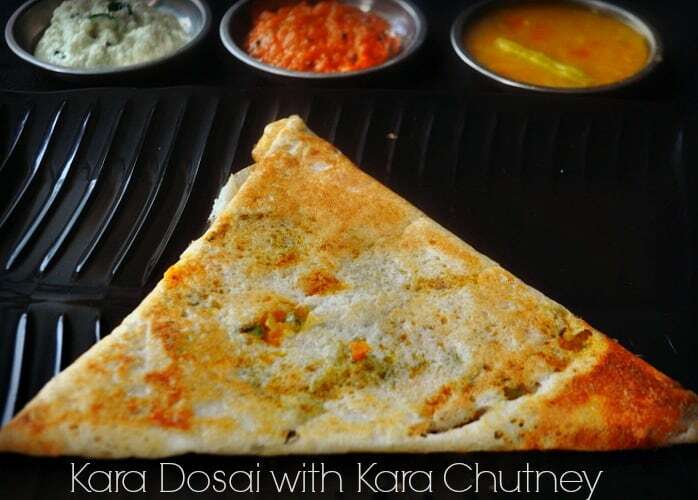 Serve kara dosai with kara chutney, coconut chutney. To make this dosa so check how to make dosa/idli batter recipe. Heat a kadai and temper with mustard seeds and spilt urad dal. Add finely chopped onions and tomatoes,fry till transparent. Add capsicum, fry for a minute in medium flame. Add red chilli powder,turmeric and salt. Fry till everything turns mushy and to a masala. Add the mashed potato and blend well for a minute in medium flame. Add ⅓ cup water, cook covered for 5 minutes in low flame (or until veg are cooked). To make dosa (I used my idli dosa batter itself), pour a laddle full of batter and spread evenly. Let it get cooked half way, then place the masala, 2tblsp, in the mid. Fold Slightly the down part first. Again fold the two sides to make a triangular shaped dosa. You can fold into two simply as well. Just finished my breakfast but now hungry again.. Parcel pls….